My fiancé and I fly up to Rhode Island for a Nozzi family gathering. We rent two houses (we have a BIG Italian family) on Misquamieut Beach. We find the beach jammed with people and the water icy cold (particularly for Floridians like us!). We also discover that Rhode Island seems to be unable to understand how to install signs for roads. For a disturbingly large number of roads, there is no route or road name for the road intersecting. Of course, there is also the problem of a road name changing 6 or 8 times as you drive along it. We take a day trip to the Mystic Seaport (photo at left). 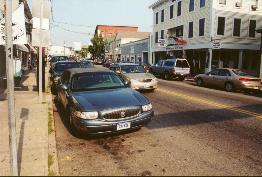 This town contains a pleasant, walkable, vibrant town center. A bit too touristy for our taste, but overall a nice place to visit. Similarly, the town of Westerly at the border of Rhode Island and Connecticut is a walkable, historic town center with a "river running through it." We visit Boston. I leave my fiancé for her to be interviewed, and a friend takes me on a short walking tour of downtown Boston. 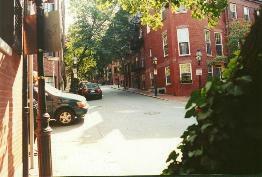 I had visited the city previously, but it when I was young and unaware of one of the most important urban delights in Boston: Beacon Hill. We walk the Beacon Hill streets for a few hours. Stupendous urbanism (photo below). I envy the brownstone rowhouses, and am astounded to learn how expensive they are. It is no wonder. Their walkable urbanism and romantic ambience of their streets is increasingly priceless in a nation that is losing this important, traditional charm. We find, to our dismay, that it is difficult to find fresh, uncooked shrimp in the supermarkets in Misquamieut Beach. Our trip to this region ends by our driving the rental car back to the Providence airport. I am shocked to notice that the State of Rhode Island has, along its interstates, authorized the use of the interstate shoulders as travel lanes during peak periods!!! WHAT???? ?